Circular No. 4183 (Second Series). Flag for Customs use: new form of, prescribed; history of Customs jack. 1.-The first flag authorised for use on Customs cruisers and floating property was the familiar rectangular green one with the diagonal yellow cross (I.G. Circular No. 5 of 1867). This flag, it is interesting to recall, had its origin in a proposal made by Mr. H. N. Lay, the first Inspector General, when on leave in England in 1861-2. As will be remembered, Mr. Lay was at that time engaged in purchasing a fleet of cruisers for the use of the Chinese Government, and as China at the time of the purchase negotiations had no national flag, and as it was necessary that these vessels, after being purchased by China, should on the voyage out fly a distinctive ensign in order to avoid risk of capture or detention, Mr. Lay made the suggestion that that ensign should be a yellow diagonal cross on a green ground*. The British Naval authorities, however, declined to recognise this ensign until its adoption had been approved by the Chinese authorities at Peking, and to secure this approval Lord Russell, then Secretary of State for Foreign Affairs, wrote to Sir Frederick Bruce instructing him to inquire of Prince Kung whether the Chinese Government would sanction the adoption of the flag in question. This led the Imperial authorities at Peking to decide that the national flag of China should be a triangular one, the ground to be yellow and the design to be a dragon with its head towards the upper part of the flag. 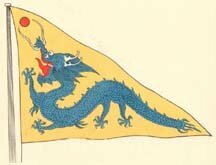 In October 1862 an Imperial Edict was issued to this effect**, and Mr. Lay was instructed that the flag to be flown on the cruisers he had purchased for China was to be a green ground with a yellow diagonal cross, bearing in the centre a yellow triangle with an Imperial blue dragon***. Under this ensign the Sherard Osborn flotilla, which Mr. Lay had recruited, came out to China, and as this flotilla was sent home again shortly after its arrival, its flag naturally disappeared with it. The memory of it, however, remained, and so, when four years later (1867) a distinctive emblem was required to mark Customs cruisers and floating property, it was natural that the green flag with its yellow St. Andrew's cross should once more be revived �. 2.- Up till the spring of 1873 this green flag with the yellow cross was flown on customs cruisers and floating property, and thus came to be widely known as a distinctive Customs emblem. In that year a change was made, and orders were issued that the use of this flag was to be discontinued and its place taken by the dragon ensign - a triangular yellow flag with a red sun and a blue Imperial dragon��. In 1889 this triangular flag was discarded and its place taken by a rectangular one of the same colour and bearing the same design�. After the proclamation of the Republic in February 1912 the picturesque dragon flag as a national emblem was abolished and the five-barred Republican flag, with its horizontal bars of red, yellow, blue, white, and black, proclaimed to be the national flag��. In December of that year the Government, on the Inspector General's representations, decided that a distinctive flag should be flown by Customs cruisers, and thus the old green flag with the yellow diagonal cross came officially to its own again, this time as a jack in the upper canton of the Republican five-barred flag�. This official recognition of the Customs jack was of considerable value during the disturbed years 1927 and 1928, as it served to distinguish and protect Customs property in areas where the five-barred Republican flag could no longer be exhibited. The ultimate victory of the Nationalist forces led to the introduction of the present national flag - red ground with a blue jack in the upper canton, the jack bearing in its centre a white sun with 12 white rays based on a blue ring encircling the sun. On my recommendation it was agreed that, in order to establish the identity of Customs craft, etc., a distinctive device on the national emblem should be allowed. This device took the shape of a circle with green ground and yellow diagonal cross placed in the fly of the national emblem��. 3.- From the appended copy of Kuan-wu Shu despatch No. 4449 you will see that the Government has now decided that this latter flag for Customs purposes is to be discarded, and its place is to be taken by the national flag with four wavy green banks running across the red ground in the manner and in the proportions shown on the accompanying sketch (Enclosure No. 2). You are accordingly, as soon as convenient, to replace present flags with those of the newly authorised design and to fly such in future on all Customs vessels and Customs floating property. As, however, the Customs green jack with the yellow diagonal cross has been consistently flown at the bow in our cruisers and launches, even during the period when the dragon flag was prescribed for use on customs boats, and as there is nothing in the Government's present instructions forbidding such use of the Customs jack, you may continue to fly at the bow the traditional green and yellow jack which has had so long and so honourable an association with the Customs Service. 4.- For purposes of reference I append also coloured reproductions of the various flags authorised by the Government for the use of certain highly placed officials and of the various Government Departments whose work necessitates the use of distinctive emblems. *B.P.P., China No. 2 (1864), pp. 1 and 2. **B.P.P., China No. 3 (1864), p. 42. ***B.P.P., China No. 2 (1864), p. 4. �I.G. Cir. No. 5 of 1867, antea, vol. i, p. 76. ��I.G. Cirs. No. 5 of 1873 and No. 48 of 1875, antea, vol. i, pp. 350-359. �I.G. Cir. No. 459, Second Series. ��I.G. Cir. No.1881, antea, vol. iii, pp. 57-61. �� I.G. Cir. No. 3848." According to Album des Pavillons (2000), the custom's flag is still in use, as well as the flag of the General Inspector of Customs, a green field with a yellow saltire and the canton of the national flag in the middle. The national flag with green serrated stripes. Construction sheet is similar to the civil ensign. As in the case of civil ensign, the usage of this flag still has to be confirmed - it was once used, but now it seems that it is altogether replaced by the national flag, and for a long time no one reported it seen in use (as far as I am aware). The Custom's flag shown in the 1939 Flaggenbuch and dates from the Republic of China (Kuomintang regime). I don't know if it is still in use, and the 1990 Album des Pavillons shows a different flag for the Director General of Customs, which is also shown in Flaggenbuch. A flag similar to this is shown in the 1930 edition of Jane's Fighting Ships as well as being identified by Whitney Smith (Flags Through the Ages and Across the World, 1975) as the Merchantile ensign. The flag differs in that it has of the yellow and gold stripes shown instead of the green stripes shown in this flag. I believe this flag is no longer valid. I received a reply from Republic of China representatives in Tokyo that they have not seen the yellow or green striped flag in Taiwan. The customs-flag of China is the state flag with a key and the staff of Mercurius crossed in the lower right corner. The flag was adopted 1949. The Chinese Customs no longer uses the special ensign, and flies the usual state flag instead; the 'key and staff' emblem, however, remains the official badge of the Customs.